When looking for clear storage solutions, shopPOPdisplays has you covered! We carry a variety of acrylic boxes with hinged lids. Want the benefits of using an acrylic box, but with a hinged and locking lid secure product displays? Look no further! 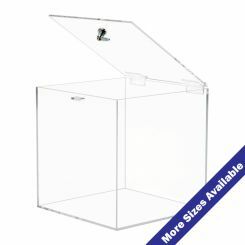 Below you’ll find our acrylic box with hinged lid and acrylic box with locking lid selection of lockable acrylic boxes. Use them in retail environments for larger sized dump bins, use them in the office to store files or kitchen goods, or at home, just to see what is inside for easy location. Whatever the use, our plastic box with hinged and locking lid will be up to the task and will perform it with a beautiful appearance in mind. Ever have a storage box and lose the lid? With our plastic boxes with hinged and locking lids, you’ll never have to worry about misplacing a lid and get the added benefits of secure covered storage! Use these acrylic boxes with hinged lids for convenient retail dump bins – store wrapped candy, loose toys, and trinkets, any bulk items found in stores, our plastic box with hinged lid can handle them all! Want something a little more secure? We also offer an acrylic box with a locking lid! Utilize the locking lid to keep unwanted hands from going through the contents inside! Each acrylic box with hinged or locking lid makes for great dump bins, display boxes, or simply storage containers that allow for high visibility. 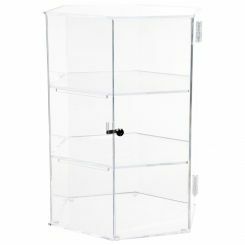 What are the Benefits of Hinged Acrylic Boxes? There are a variety of benefits to using hinged acrylic boxes to store goods. In retail stores, they are perfect to use as dump bins that keep your merchandise safe, secure, and beautifully displayed. Accessories, wrapped candy, beauty products, jewelry, and decorative objects are just some of the many examples that work perfectly inside of hinged acrylic boxes. 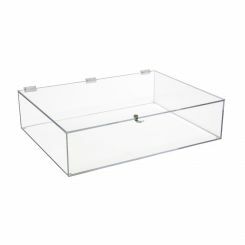 Hinged acrylic boxes also help preserve the quality of your inventory by protecting your goods from dirt, debris, and dust, while serving as a sleek storage alternative for your at-home needs. Use them inside of your bathroom or kitchen to store cotton balls, soaps, kitchen goods, and other household toiletries. Easy to move around and rearrange, acrylic hinged boxes keep items organized while making it easy to change their placement for ever-changing, dynamic visual displays. 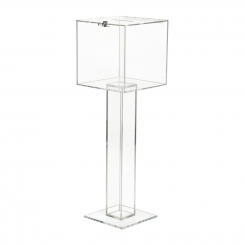 What are the Benefits of Lockable Acrylic Boxes? Extremely useful in retail environments, lockable acrylic boxes provide a safe and sleek presentation for high-value items. Available in a myriad of sizes, lockable acrylic boxes will elegantly show off your valued goods, while safely securing them. Because visual displays are located in various areas inside of a shop, it can be hard to monitor activity around them. Placing inventory inside of a lockable acrylic box provides the same minimal, modern presentation of a regular acrylic box, with added security to ensure your products stay safe from theft. They are perfect for electronics, jewelry, household novelties, accessories, garments, and so much more. Yes, acrylic boxes are durable and reliable. Suitable as an impact-resistant alternative to glass boxes, they are also stronger, more shatter-resistant and resistant to the elements and erosion than their glass box counterparts. Acrylic boxes are an ideal solution for in-store displays, because of their resilience to breakage, making them a smart option for visual presentations. It takes a considerable amount of force to crack acrylic boxes compared to glass, so not only it is safer for a retailer it is also a cost-effective, long-term investment.